The Jerusalem Post online news site is reporting that, even though the Israeli Beresheet spacecraft did travel and orbit the moon, the final maneuver — the landing — was unable to arrive on the lunar surface. As the spacecraft approached the moon, SpaceIL lost contact with Beresheet several times, according to the infosite. The scientists kept hope as the connection was restored; however, just minutes before the spacecraft was supposed to touch down in the northeastern part of the Sea of Serenity, contact was lost once again and the craft crashed on the moon. Prime Minister Benjamin Netanyahu, who was at hand to watch the landing, said that Israel will continue to try landing on the moon. Minutes later Netanyahu took to the microphone again to promise "Israel will land on the moon!" Tens of thousands of Israelis had stayed up until the wee hours of the morning to watch the lunar lander’s launch from Cape Canaveral in Florida on February 21 aboard a SpaceX Falcon 9 rocket. Although a disappointment for the nation of Israel, SpaceIL and the Israel Aerospace Industries, rest assured this mission will become a learning experience that will ultimately lead to success. An Israel Aerospace Industries (IAI) spokesperson added, "IAI is proud to be part of this amazing journey with SpaceIL that brought us to the moon. We will continue to lead Israel to unbelievable achievements. The Beresheet effect will continue to lead the children of Israel to dream about Beresheet 2.0." All is not lost — XPRIZE is recognizing SpaceIL's achievement with a $1 million Moonshot Award for this groundbreaking attempt ... the company's team's successful entry into lunar orbit and the attempt to soft land on the lunar surface certainly captured the public's attention and imagination and should inspire the next generation of scientists and explorers... as XPRIZE so aptly stated, this mission has propelled the commercial space industry forward. Preliminary data supplied by the engineering teams of SpaceIL and Israel Aerospace Industries (IAI) suggests a technical glitch in one of Beresheet's components triggered the chain of events yesterday that caused the main engine of the spacecraft to malfunction. Without the main engine working properly, it was impossible to stop Beresheet's velocity. Beresheet overcame the issue by restarting the engine. However, by that time, its velocity was too high to slow down and the landing could not be completed as planned. Preliminary technical information collected by the teams shows that the first technical issue occurred at 14 kilometers (8.7 miles) above the moon. At 150 meters (492 feet) from the ground, when the connection with the spacecraft was lost completely, Beresheet was moving vertically at 500 km/h (310.7 miles) to the inevitable collision with the lunar surface. Comprehensive tests will be held next week to gain a better understanding of the events. "IAI, together with SpaceIL, built the first Israeli spacecraft, Beresheet, which succeeded in traveling 400,000 kilometers (248,548.5 miles) from Israel until it touched the moon," said Harel Locker, Chairman of IAI. "This is a tremendous technological achievement for the State of Israel, which is now among only seven superpowers who have reached this close to the moon. This project lasted eight years and contributed significantly to the Israeli space industry, which today became one of the leading space industries in the world. Space travel is infinite, exciting, and inspirational. IAI is the core of the Israeli national knowledge when it comes to space technology, and it will continue to lead Israel to more technological achievements in this field. IAI engineers and staff are working 24/7 on developing new technology for Israel and its security. For them, the sky is not the limit, it's just the beginning." The engineering teams of SpaceIL and IAI have successfully performed the final maneuver before Israel’s historic lunar spacecraft, Beresheet, lands on the moon. The maneuver, which was performed at 7:40 p.m.on April 10, Israel time, lowered the spacecraft’s altitude in preparation for the landing tomorrow. Following the maneuver, Beresheet is again in an elliptical orbit, with its perilune (the closest point to the moon) only 15-17 km. (9 -10 miles) from the moon’s surface and its epilune (the farthest point from the moon) at 200 km (124 miles). The maneuver was performed on the far side of the moon with no real time communication. The spacecraft’s engines were activated for 32 seconds and 5 kilograms (11 pounds) of fuel were consumed. UPDATE #12: At 7:48 a.m. Israel time on April 8, the engineering team of SpaceIL and Israel Aerospace Industries successfully carried out another maneuver of Israel's historic lunar spacecraft, Beresheet, in its orbit around the moon. During the maneuver, Beresheet's engines operated for about 36 seconds, burning about six kilograms (13.2 pounds) of fuel. The maneuver also took Beresheet closer to the moon's surface, from 750 kilometers (466 miles), called the apolune — the farthest point from the moon —-- to 210 kilometers (130 miles), or perilune, the orbital point closest to the moon. Beresheet is now in an elliptical orbit at an altitude of between 211 kilometers (131 miles) to 467 kilometers (290 miles) around the moon. Over the weekend, Beresheet took more photos of the far side of the moon from 550 kilometers (341 miles) and from 2,500 kilometers (1,553 miles) from the moon. 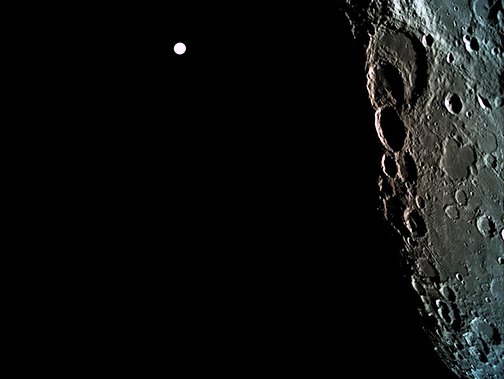 Beresheet's image capture of the far side of the moon, with Earth in the background — also at 470 km from the moon. Photo is courtesy of Eliran Avital. 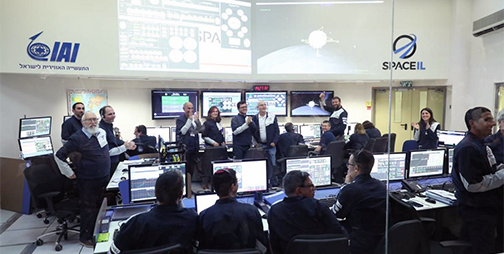 Israel’s historic spacecraft, which entered lunar orbit on April 4 on its journey to the moon - is on an “excellent” track, according to overnight data from the SpaceIL and Israel Aerospace Industries (IAI) engineering teams at their control room in Yehud, Israel. During its lunar orbit, Beresheet will be at its nearest point to the moon (perilune) at 470 km (292 miles) from the lunar surface, and the farthest from the moon (apolune) at 10,400 km (6,462 miles). Beresheet is scheduled to land on the moon at about 11:00 p.m. Israel time on April 11 - though a more definite time will be announced in the next few days. During the coming week, SpaceIL and IAI will conduct a series of intense maneuvers with the spacecraft in preparation for the landing. On April 4, during the critical Lunar Capture maneuver, when the spacecraft entered the moon’s orbit from the Earth’s orbit, Beresheet provided dramatic pictures of the moon while activating its engines. SpaceIL’s engineering team and Israel Aerospace Industries (IAI) during the evening of April 4, at 5:17 p.m., conducted the most critical maneuver to date of Beresheet’s journey to the moon — the Lunar Capture. This maneuver enabled the spacecraft to be captured by the moon’s gravity and begin orbiting the moon — and with the moon, orbiting the Earth. SpaceIL and IAI engineering teams in the control room after the lunar capture maneuver by Beresheet. Photo is courtesy of the mentioned companies. This maneuver moved the spacecraft into an elliptical orbit around the moon, with the closest point (perilune) 500 km. to the moon, with the farthest point (apolune) 10,000 km. from the moon. Unlike the longer orbits around the Earth, Beresheet’s first lunar orbit will last 14 hours. Before the craft lands on the moon, each orbit thereafter will take only two hours. At the beginning of this week, Beresheet reached, for the last time, the closest point to Earth in its last Earth orbit, only 1,700 km, and continued on course to the point where it could join the lunar orbit, 400,000 km. from Earth. SpaceIL Chairman Morris Kahn said that the lunar capture is an historic event in and of itself — but it also joins Israel in a seven-nation club that has entered the moon’s orbit. A week from today, more history will be made by landing on the moon, joining three super powers who have done so. — I am proud to be an Israeli. SpaceIL CEO Ido Anteby added that after six weeks in space, the company has succeeded in overcoming another critical stage by entering the moon’s gravity. This is another significant achievement the firm's engineering team achieved while demonstrating determination and creativity in finding solutions to unexpected challenges. There is still a long way to go until the lunar landing — the team will complete the mission to land the first Israeli spacecraft on the moon, making all proud. IAI CEO Nimrod Sheffer noted that after a challenging journey, tonight another Israeli record has been made and became the seventh nation to orbit the moon. Even before Beresheet was launched, it already was a national success story that shows the team's groundbreaking technological capabilities. He added that new heights have been accomplished and the engineering team will work 24/7 to bring this historic landing event to fruition on April 11. Good luck Beresheet. Beresheet has experienced two challenges, which the engineering team has been able to overcome: one with it’s star trackers, which were blinded by the sun more than expected, and the other involving undesirable restarts of the mission computer. The Israeli spacecraft Beresheet was launched to the moon on February 22 at 3:45 a.m. Israel time (8:45 p.m. local time) from Cape Canaveral, Florida, on a SpaceX Launchpad by a Falcon 9 rocket as secondary payload alongside two satellites. The first data from the spacecraft was received by 4:23 a.m. and at 4:25 a.m. Israel time, when Beresheet deployed its landing legs as planned. Beresheet’s launch was historic, becoming the first Israeli spacecraft to travel beyond Earth’s orbit. The engineering teams of SpaceIL and Israel Aerospace Industries (IAI) on April 4 will perform the most critical maneuver yet in Beresheet’s journey to the moon. Lunar orbit insertion, or “Lunar Capture,” as the maneuver is called, allows the spacecraft to enter the moon’s gravity and begin orbiting prior to landing. So far, Beresheet has been circling Earth in elliptical orbits and has performed several maneuvers in order to send it higher and further away. Earlier this week, Beresheet passed its closest point to Earth for the last time, at 1,700 kilometers (1,056 miles), and continued to its meeting point with the moon at a range of 400,000 kilometers (248,548 miles). "Beresheet's Journey to the Moon." Unlike maneuvers Beresheet has performed so far, when its engines were operated to accelerate the craft, the current engine operation is meant to slow the spacecraft’s velocity, so it is captured by lunar gravity. The braking will reduce Beresheet’s velocity relative to the moon from 8,500 km/h (5,281 mph) to 7,500 km/h (4,660 mph). If the slowdown does not take place as planned, the spacecraft risks leaving Earth’s gravity while missing the moon’s gravity and will enter a different and undesirable orbit in the solar system. This would bring the mission to an end. A successful maneuver will position the spacecraft on an elliptical orbit around the moon, in which the nearest point (perilune) is 500 km (310 miles) away from the moon, while the farthest one (apolune) is 10,000 km (6,213 miles) away. 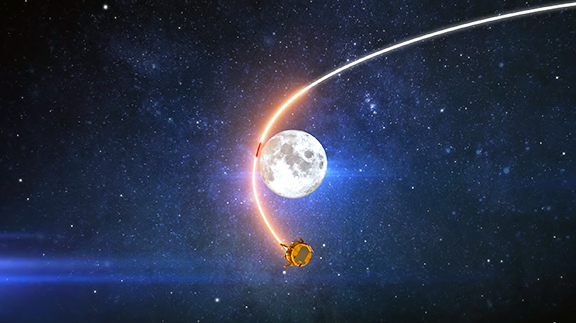 In the week following the capture, the SpaceIl and IAI teams will perform several maneuvers to reduce the orbits around the moon from an elliptical to a round orbit 200 km (124 miles) above the moon. Unlike the long Earth orbits, the first lunar orbits will last 14 hours. As Beresheet approaches landing, each moon orbit will last only two hours. These maneuvers are meant to lower the spacecraft’s altitude and reach the optimal point for autonomous landing in the moon’s Sea of Serenity the evening of April 11. The craft has used 80 kg (176 pounds) of fuel, so far.